Posted by Jon in Street Fighter, Takara, Transformers with 3 comments. 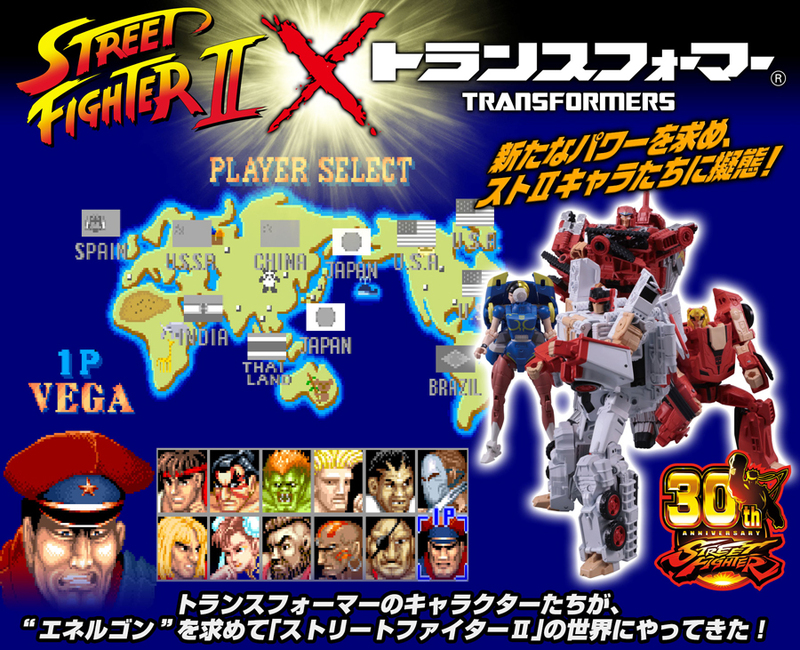 It’s only been a couple of days since magazine scans revealed Takara’s Transformers x Street Fighter two-packs. Now we have a whole batch of official pictures of the two-packs since preorders have gone up on Takara’s official store. As we posted previously, these Street Fighter themed Transformers will be coming in two-packs, and are exclusively sold through the Takara Tomy Mall storefront. The first pack is M. Bison (Vega in Japan, just so nobody is confused when you get the box and it has that name) vs Ryu. M. Bison uses the Titans Return Blitzwing body with a unique Titan Master that looks like the in-game character. Ryu is based off of the Titans Return Octone mold and, again, has a character themed Titan Master. The set is currently up for order at the Takara Tomy Mall, but unless you live in Japan you’ll need to track down an importer. The asking price for the set is 12,960 YEN. Our next pack is Ken vs Chun-Li. Ken uses the Titans Return Hot Rod mold, while Chun-Li is a Generations Arcee. Unfortunately, Chun-Li will not come with a Titan Master. This set is also up at the Takara Tomy Mall with an asking price of 8,640 YEN. is it weird that I am bothered by Ken and Ryu not sharing the same mold? Nah, I totally get it. I imagine they really wanted to use that Generations Arcee for the round legs so they had to find something smaller to go with her. Hrrrrnnn……I totally am starting to want these. DAMMIT Takara.